The Sheep Whisperer: Fast & Furious! 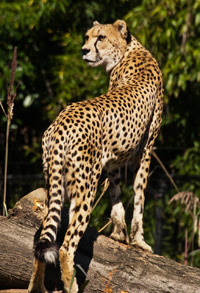 Cheetahs have the distinct honor of being the fastest land animals on the planet. At top speed, these cats motor at an average of 64 mph! They use this speed in a hunting maneuver known as the "chase-trip-bite ". 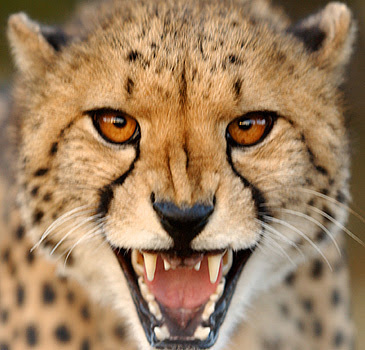 When cheetahs are in pursuit of prey, they stalk it until an opportune time for a "surprise-attack". They attack & it takes approximately 10 seconds to secure the catch, by tripping it with their only sharp claw on their front paw, the dewclaw. They bite the throat of the prey to suffocate it & complete the maneuver. I dare Ewe to try & outrun me! 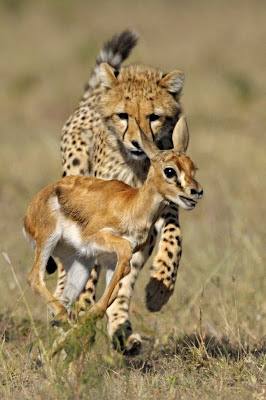 Cheetahs need to be swift in their capture of prey. They are not built very strong , in comparison to lions, & must not stir up a cloud of dust while hunting, or they will draw the attention of bigger predators that will steal their prey. They quickly gorge themselves to avoid trouble with hyenas & lions, which would gladly relieve the cheetah of its meal. Feeding my family is tough in this economy! 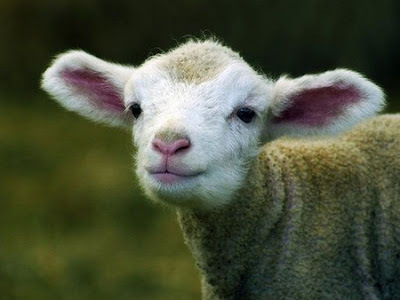 I will track Ewe down & eat Ewe! I'm an Olympic runner , so Ewe might as well give up! 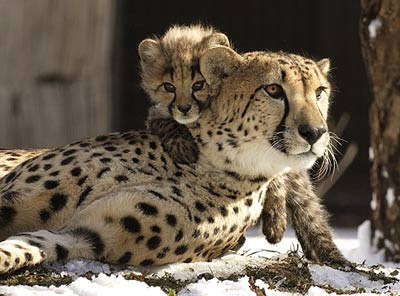 Cheetahs belong to the Felidae family, & are regarded the smallest of the big cats. 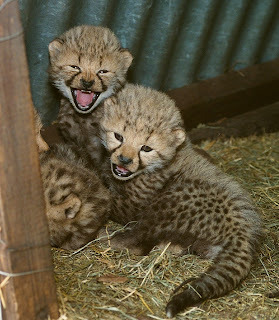 They can't roar, however, do hiss, growl, whine, & use chirping, birdlike calls to communicate. 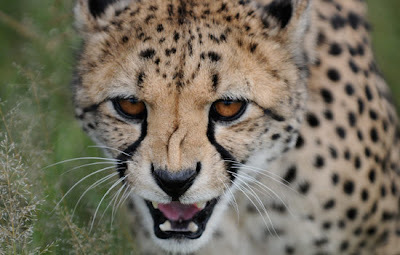 Cheetahs are known for their famous "tear marks" in the corner of their eyes. They sport solid black spots on a backdrop of yellow or tan fur. Their coloring helps to camouflage them in the grasslands of Africa. They also have 4-6 rings at the end of their tails. 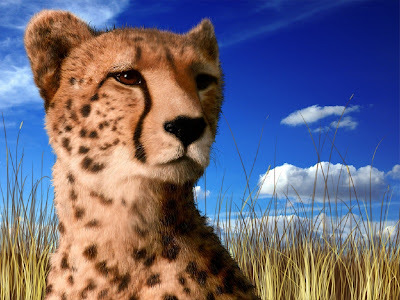 Some researches believe that the "tear marks" assist the cheetahs in their fighting off the glare during their daytime hunting. I'm really crying because it's dangerous holding onto ewer prey! grow to 44-53 inches long, with a tail of 26-33 inches in length. Adults will weigh from 86 - 143 lbs. They eat small to medium size animals & rarely climb trees, but prefer low hanging branches. 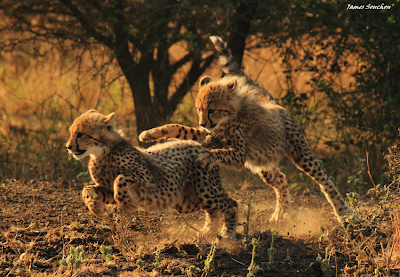 Cubs chase each other & accuse one another of being a "Cheetah"! DON'T EWE THINK WE'RE CUTE?Where's MAMA? Sheep are in a different category altogether than cheetahs. They're the "hunted" rather than the "hunter"! They must rely on their trusty Shepherd to protect them from predators. Why Worry, Be Happy! Trust in the Shepherd! 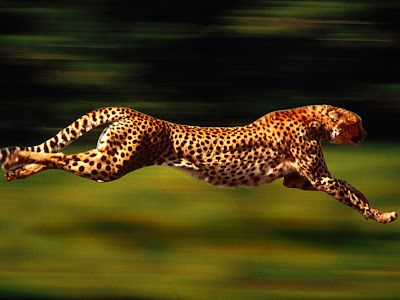 Life sometimes speeds by very quickly, almost as quickly as a cheetah! Take time today to slow down & smell the "roses" that the Good Shepherd has placed in Ewer midst!